If you live in the south where humidity is high, you will run across mold on leather or some of your gear from time to time. This usually happens when you take a break from the horse world for a bit and keep your gear stored in a dark saddle house or in the tack compartment of your trailer when temperature and humidity are at their worst. Having trouble getting to the tight areas when oiling that saddle in your tack room? Here’s a trick I have learned! Pam makes a spray olive oil that, although maybe a little pricey, works great for those spots a big fat hand won’t fit! Since we oil all our leather products with good clean olive oil, this oil in a spray can is a great complement in our shop and takes a lot of pressure and worry from the hard to reach! Try this out and let us know what you think! This will be the first of a few blogs on putting a new tree in a saddle. In my opinion few saddles are worth the money to put a new tree in them. The misconception among most folks is that putting a tree in a saddle is something easy to do and is cheaper than getting a new saddle. Both of which are false. For most saddles, a broken tree should be the end of the road. The thing to remember when contemplating the retree of any saddle is the age of the saddle. When we do a retree in the shop, ALL the original parts are used (except the horn and sometimes the binder) so the customer is getting back the same old saddle minus the broke tree part… And less money in their pocket. This brings us to the price of the job. We charge a minimum of $1000 including the tree repair but not including any parts that have to be replaced, if any. The thing to consider here is what the saddle would be worth after the repairs. A custom saddle in good condition may have merit but a $600 saddle in poor condition probably not. In these photos we have had the original tree completely restored and fiberglass covered making it as strong or stronger than when it was new. A new horn has been applied and we begin the retree by putting the gullet cover on and working on getting the original ground seat pieces back in place. This insures that the saddle sets as close to the same as it did before it was broken. Using the old pieces is sometimes difficult and we will sometimes have to install a completely new tin strainer and ground seat because they get destroyed taking them out. This adds cost to the job. As you will see in the next few postings, putting a new tree in a saddle is anything but simple and very labor intensive. If a saddle is built correctly, it should be tough… Saddles, when built right, are not built to be taken apart. “if it ain’t broke don’t fix it”. 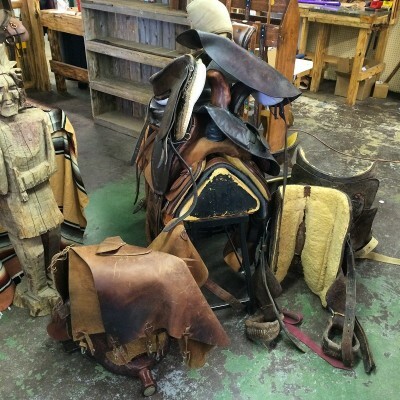 This seems to be the thought with most people when it comes to their saddles, but this idea could lead to having to fix some body part when it comes to stirrup leathers. Some get lucky and the stirrup leather will brake right as you put your weight in the stirrup getting on or off your horse. Unless your riding a colt, this is usually in eventful. Other unfortunate souls will be leaned out over a steer or yearling about to take that perfect shot when… Here comes the ground. Ouch! Take a second to check your leathers every so often. Look for heavy corrosion of the Blevins buckle, this can lead to the actual buckle braking. Look at the holes, are they stretched out or have cracking around the hole. Also, try to fold the leather in a couple spots. If you see the leather crack at the fold then it is probably time for a new pair. When you decide that you need new stirrup leathers, or after the accident, replace both sides and DO NOT patch them. Patching stirrup leathers may be cheaper, but you are only buying time till… Here comes the ground! Ouch!